In 1886, Governor John Martin organized Kiowa County and named it after the native Indians of the area. Small settlements were springing up across the plains. 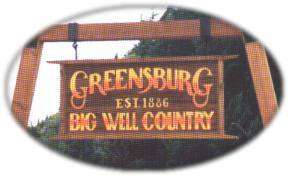 Donald R. Green "Cannonball Green" was instrumental in the organization of Greensburg, the town that would bear his name. Green was elected Kiowa County's first representative in the Kansas legislature in 1889. Colonel Green was a flamboyant, boastful character. He liked to dominate a crowd while twirling his diamond-studded watch chains. He owned and operated "The Cannonball Stageline." His fine stagecoaches and speeding broncos blazed trails which railroads and highways later followed. He took great pride in the speed of his coaches and advertised that even "Father Time" couldn't keep up with the "Cannonball". His stageline brought stability and prosperity to the towns it served as he helped his passengers become acquainted with prairie life. But his stageline was up-staged when the railroad came to Kiowa County. And that begins the story of the World's Largest Hand Dug Well!